Not all pain is visible. It’s not as if anguish is something you can diagnose with a simple assessment—or treat with a pill. Hurt, after all, can cut scars far deeper than what we see with our eyes. These are truths I’ve learned working as an international volunteer with Medical Teams International, where for the past several years I’ve been privileged to travel the world and serve families in their moments of suffering. From my first trip to Haiti, Medical Teams empowered me to bring every part of myself to the role. On that mission I discovered how much I loved working alongside local nurses in a mentoring role. I had always felt a strong calling to work in places that had been forgotten, or with people who lacked access to health care. My introduction to volunteering goes all the way back to when I was a teenager, when I would spend life-changing summers in rural Mexican villages. The community we worked in had very little access to health services. During my time in this community, I got to know a local business owner who let our volunteer group operate out of his restaurant. I still remember vividly how I came upon him one day lying in the street. He’d been hit by a car. He died that day. And he died because there were so few health services in his community. I was still young at the time, just a teenager. There was only so much we could do for him. But it left an indelible impression on me. That event made me understand how helpless you can feel in a moment of crisis. The desire to work in humanitarian aid came from a very young age, partially propelled forward by my experiences as a teenager working in Mexico. As a Christian, I believe that the Holy Spirit lives within each of us. We take the sword of the spirit when we enter into places of grief and pain and are able to do so much more than we could if we were simply relying on our own efforts. To be physically and spiritually there for a suffering person is a privilege I cherish. 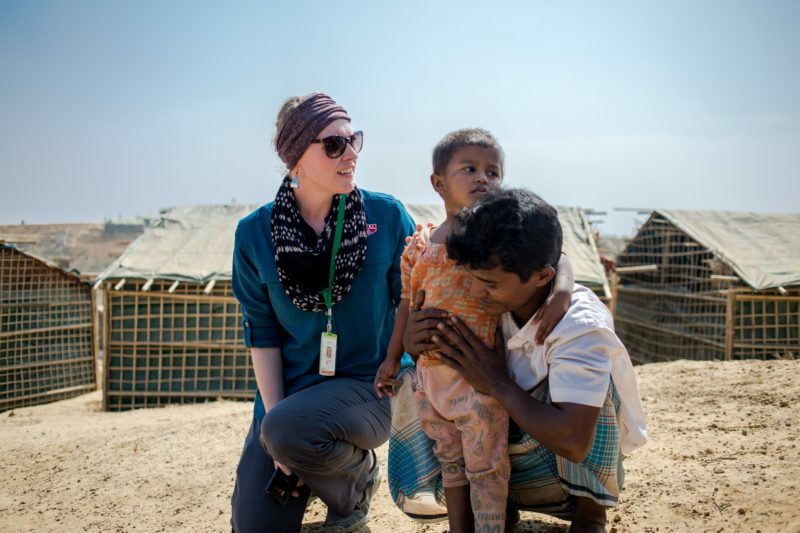 It’s incredible to feel as if I can bring every part of myself to this role, especially in a place like Bangladesh where we serve thousands of Rohingya refugees. I’ve seen how the power of being present helps so many lives in Bangladesh, where Medical Teams runs health clinics. Families come to our clinics not simply because they receive health care but because they feel listened to and loved. Sarah, left, with Abdur and his daughter. I remember at one of our clinics we saw a man named Abdur who had an abscess on his face. He’d just lost several family members to a fire. When my interpreter and I met Abdur, he was in so much emotional pain that he talked of suicide. Distraught, he asked that we pray with him. We sat with him. Me a Christian, my interpreter and Abdur both Muslims. And together we prayed. Abdur held my hand so tightly, as if he didn’t want to let go. Abdur and Sarah in Abdur’s home in a refugee camp in Bangladesh. It was an incredible experience to see him again 10 days later. His abscess was gone, and he was happy. He asked that we keep coming back to pray with his family. Volunteering opened my eyes to things I wouldn’t have been aware of, and it allowed God to speak to me and others in profound ways. When we send volunteers, the philosophy is to leave people in a better place—physically, emotionally and spiritually. You too can volunteer for Medical Teams International. For me, it opened up a world of possibilities. It allowed me live my faith and help others. It also exposed me to people who shared these views, a community of amazing people from all over the world. You too can make a difference by bringing health and healing to suffering people during times of disaster and crisis. Consider volunteering for Medical Teams International. 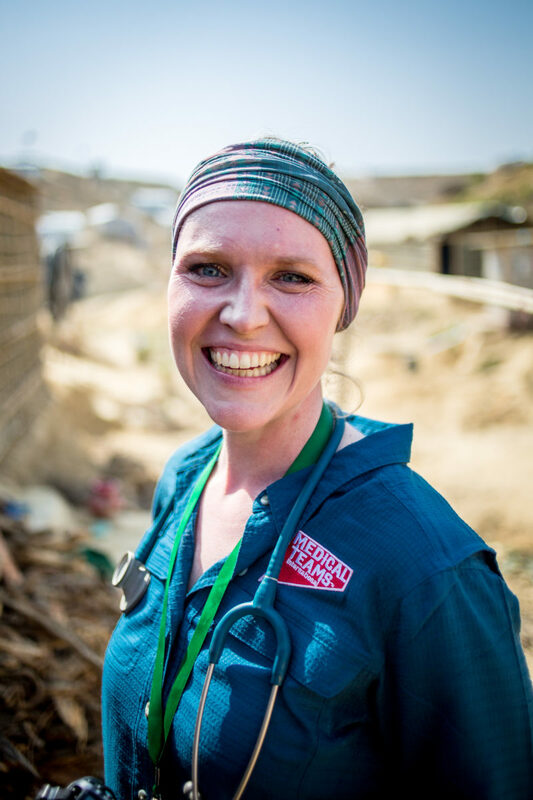 Whether you are a medical professional or have a different skill, by volunteering you’ll be supporting people in need. This is the power of being present. For many refugees fleeing Bangladesh, their suffering doesn't end with the arduous journey to the camp.